Head coach of Super Eagles, Gernot Rohr, has admitted that he does not have a lot of star players in his squad. However, Rohr says with team and tactical discipline, Nigeria can go far at the 2018 World Cup in Russia. “In the team we are working on improving all segments of the game, only if you have everything you need, you can succeed in today’s football. “I said already, today I do not have a lot of stars, but we want to have a big team with a winning mentality, great discipline in the field and beyond, and a great deal of mutual solidarity and communion. This is the way to success,” he told Sportske Novosti. 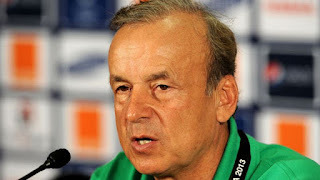 Rohr also spoke about recent friendlies with Argentina, Poland and Serbia. “Friendlies are completely different from the matches at the mundial. Friendly games are like an experiment in the lab, while matches in the World Cup are realistic, real life. “I do not bother too much of the victories and defeats in the preparatory games, we are focused on building the best teams for the World Cup,” he added.